Citation: Al hemyari B, Gulati R (2018) Uremic Alveoli: A Rare Case of Diffuse Alveolar Hemorrhage Due to Severe Uremia. J Clin Med Ther 3:10. Copyright: © 2018 Al hemyari B. This is an open-access article distributed under the terms of the Creative Commons Attribution License, which permits unrestricted use, distribution, and reproduction in any medium, provided the original author and source are credited. Uremic pneumonitis is a complication of end-stage renal disease (ESRD) that is rarely seen nowadays with hemodialysis (HD) becoming more accessible. Its pathophysiology is characterized by increased permeability of the alveolarcapillary interfaces, leading to interstitial edema, and diffuse alveolar hemorrhage (DAH). Platelet dysfunction secondary to ESRD is also a contributing factor. The pulmonary signs and symptoms usually resolve with initiating hemodialysis. Here we present a case of uremic pneumonitis in a young patient with no past history of kidney disease [1-3]. A 27 year-old Hispanic male with past medical history of unspecified congenital heart disease, presented with worsening shortness of breath, pleuritic chest pain, cough and hemoptysis for five days duration. He denied any fever, chills, wheezing, or bleeding from any other sites. Review of systems revealed decrease urination, swelling of both lower extremities, loss of appetite and generalized fatigue. He had an upper respiratory tract infection two weeks ago which now has resolved. His father had polycystic kidney disease at age thirty-six years for which had renal transplant. The patient denied ever using tobacco or recreational drugs. On physical exam, He was afebrile, his heart rate was 122 beat per minute, blood pressure 159/91 mmHg, respiratory rate of 27 breaths per minute with oxygen saturation 81% on room air. The patient was using his accessory muscles of respiration and appeared to be in severe respiratory distress. He had mild conjunctival pallor, a pan systolic murmur best heard at the left 3rd intercostal space midclavicular line, crackles on both lung fields. He also had bilateral pedal edema, but no jugular venous distension, or pericardial friction rib. A urine drug screen was negative for amphetamine, heroin, marihuana, cocaine or other toxins. An x-ray of the chest showed bilateral pulmonary vascular congestion suggestive of pulmonary edema (Figure 1). 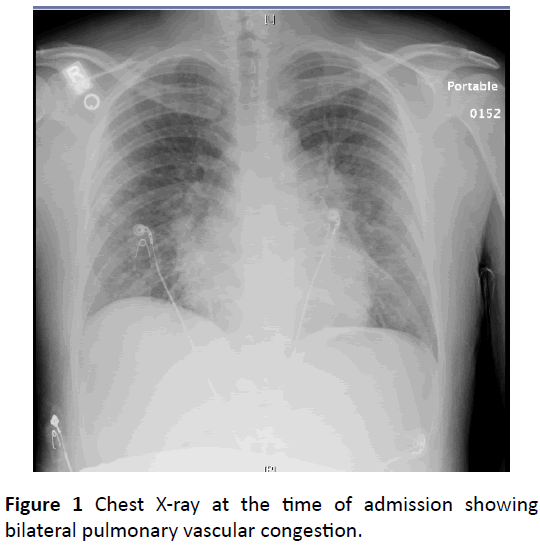 Figure 1: Chest X-ray at the time of admission showing bilateral pulmonary vascular congestion. Upon admission, the patient was intubated, and placed on mechanical ventilation for impending respiratory failure. Emergency hemodialysis was initiated for severe metabolic acidosis secondary to uremia. A transthoracic echocardiogram (TTE) showed an ejection fraction (EF) of 45%-50% with mildmoderate tricuspid regurgitation. A high resolution computed tomography (HRCT) without intravenous contrast showed bilateral airspace opacities suggestive of flash pulmonary edema. All cultures including blood, urine, and sputum failed to show any growth after 72 h.
A bronchoscopy with bronchoalveolar lavage showed diffuse alveolar hemorrhage and no evidence of viral, bacterial or fungal pulmonary infection. Given the high suspicion for pulmonary-renal syndrome, we ordered the antinuclear antibodies, antineutrophil cytoplasmic antibodies (ANCA) panel, anti-glomerular basement membrane antibodies, antismith antibodies, and anti-double stranded DNA antibodies. Shockingly, all of the above mentioned antibodies were undetected. Complement levels including C3 and C4 were within normal limits. Renal ultrasound revealed bilateral atrophied kidneys. Fluid removal via hemodialysis significantly improved the patient’s respiratory status, and was extubated after fortyeight hours. Repeated chest radiographs showed resolution of alveolar congestion (Figure 2). This scenario is typical for uremic pneumonitis. 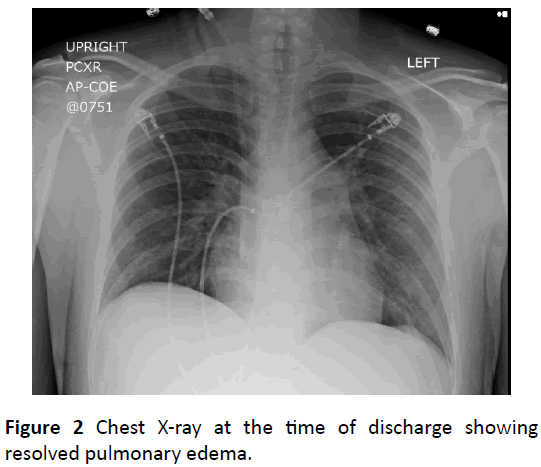 Figure 2: Chest X-ray at the time of discharge showing resolved pulmonary edema. Nephrology consult was obtained. A decision was made to pursue a renal biopsy which showed diffuse scarring suggestive of collapsing focal segmental glomerulosclerosis (FSGS). Workup to identify the predisposing factor including human immunodeficiency virus (HIV), parvovirus (B19), cytomegalovirus (CMV), quantiferon tuberculosis testing were all negative. Genetic testing was deferred to the outpatient setting. The patient was started on tapering regimen of prednisone and referred for renal transplantation. The patient denied any respiratory symptoms when seen in 2 weeks, 6 weeks, 10 weeks post discharge follow up outpatient appointment. Our case points out the development of diffuse alveolar hemorrhage as a result of uremia regardless of the cause of renal failure. Uremic pneumonitis is included in the “adult respiratory distress syndrome”. Diffuse alveolo-capillary damage, interstitial and intra-alveolar edema, widespread atelectasis, alveolar hemorrhages and pulmonary hyaline membranes are characteristic but not pathognomonic findings in uremic pneumonitis. 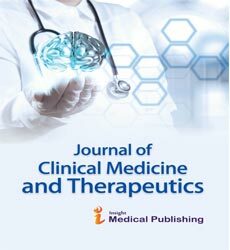 Studies have shown that neither the intensity of the urea retention nor the intensity of the creatinine retention correlate with the morphologic symptoms of uremic pneumonitis . Patients usually present with shortness of breath and respiratory distress, with radiographic findings of bilateral diffuse opacities, which all resolve upon initiating hemodialysis as soon as possible, as opposed to other causes of pulmonary renal syndrome. Our patient had a biopsy evidence of diffuse renal scarring secondary to collapsing focal segmental glomerulosclerosis (FSGS), with no previous known kidney disease. Other causes of pulmonary renal syndrome including Good pasture syndrome, Granulomatosis with polyangiitis, Systemic Lupus Erythematous and Cryoglobulinemia were ruled out. This condition was more common in the 1950-1960s when hemodialysis was not available. Although now is rarely seen with increased awareness and easy access to dialysis, it is very important for physicians to keep this condition in mind while working up a case manifested with both pulmonary and renal signs and symptoms [5-7]. ESRD is a chronic disease that requires regular monitoring of clinical parameters in order to control the natural evolution of the pathology and to make appropriate therapeutic measures. For this reason, it’s important that the patient has an adequate knowledge and involvement in the management of the disease, in order to improve clinical outcomes and reduce hospitalizations. Such patients would likely benefit from the care manager model. A care manager is a specialized nurse acting as a bridge between patients, general practitioners and other specialists. The care manager assists the patients individually, helping them to adopt behaviors and lifestyles suitable to their health condition, and encouraging greater self-sufficiency in the monitoring of clinical parameters. Hopps HC, Wissler RW (1955) Uremic pneumonitis. Am J Pathol 31: 261-273. Bleyl U, Sander E, Schindler T (1981) The pathology and biology of uremic pneumonitis. Intensive Care Med 7: 193-202. Mancini A, Cuzzola C, Giancaspro V, Petrarulo F (2012) Uremic pneumonitis: A case report. G Ital Nefrol 29: 224-229. Rendich RA, Levy AH, Conve AM (1941) Pulmonary manifestations of azotemia. Am J Roentgenol 46:802. Doniach L (1947) Uremic edema of the lungs. Am J Roentgenol Radium Ther 58: 620-628. Ciccone MM, Aquilino A, Cortese F, Scicchitano P, Sassara M, et al. (2010) Feasibility and effectiveness of a disease and care management model in the primary health care system for patients with heart failure and diabetes (Project Leonardo). Vasc Health Risk Manag 6: 297-305. Cecere A, Scicchitano P, Zito A, Sassara M, Bux F, et al. (2014) Role of care manager in chronic cardiovascular diseases. Ann Gerontol Geriatric Res 1: 1005.